Whats more traditional on game day then hot dogs? 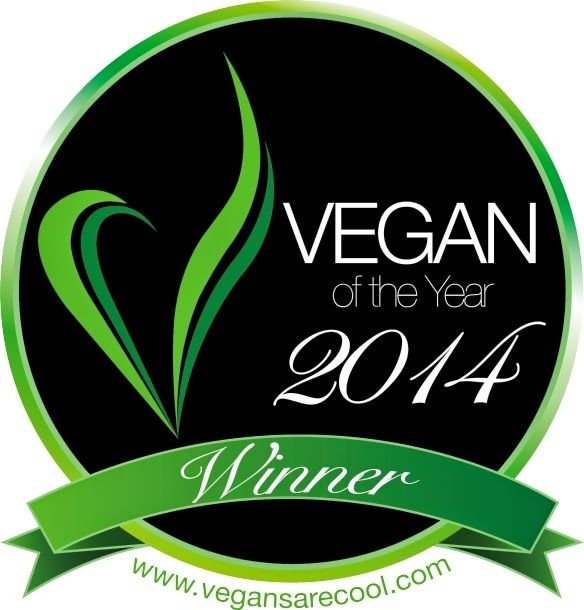 ...well other than beer...You guessed it, Hot Dogs! Hot dogs are the ultimate of game day staples, these portable easy to eat delights are completely customize-able. Everyone on the big day can top it from everything from vegan chili to basic ketchup and mustard. 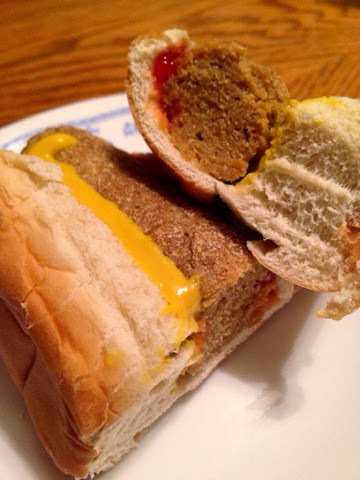 This recipe shows you how to make a perfect game day dog. Perfect for kids and adults alike! These hot dogs can be made on the grill, steamed, or even curb side as a tailgating meal. Serve with all your traditional fixings. Pairs great with all your favorite party foods and can be made ahead of time for the big day. 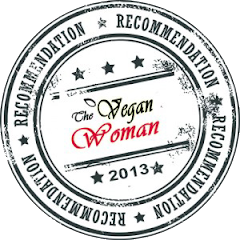 Sure to please anyone from vegan to meat eater alike, just don't forget that other game day favorite...did you forget already? The beer or root beer for the kiddos. Enjoy! In a coffee (spice) grinder, put all your spices in it. Process until completely fine and no lumps, you want the mixture of spices to be all one. This mixture can be stored in the freezer for ultimate freshness so you can make ahead. All this is going into the recipe. 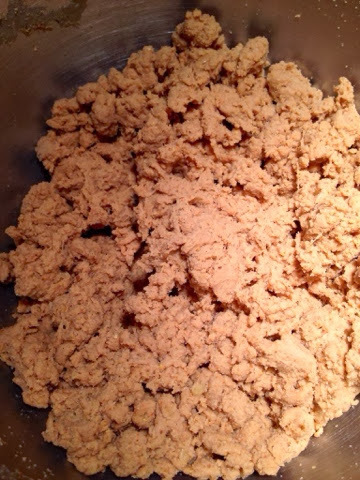 In a Kitchen-Aid Mixture fitted with a bread dough hook, combine all the ingredients, including the spice mix for the vegan hot dogs (except the flour & wheat gluten) and mix well lightly for 1 to 2 minutes until combined. After the light mixing, add in the vital gluten and flour. Knead the dough lightly until everything is combined and the dough feels elastic (scrap down and around as needed). This could take up to 5 minutes and you may need to add a little more wheat gluten until it gets to the right consistency. Once the dough is done, remove from the mixer to get ready for rolling/cooking. You will need: Plastic wrap, tin foil, 1/4 cup measuring cup, and large spoon, and a clean plate or large cutting board. You are going to want to start by getting all your items together and have a clean work-space to roll. Once you have everything set up you can begin rolling. First, lay out a piece of 4-inch piece of plastic wrap and place onto you cutting board or plate. 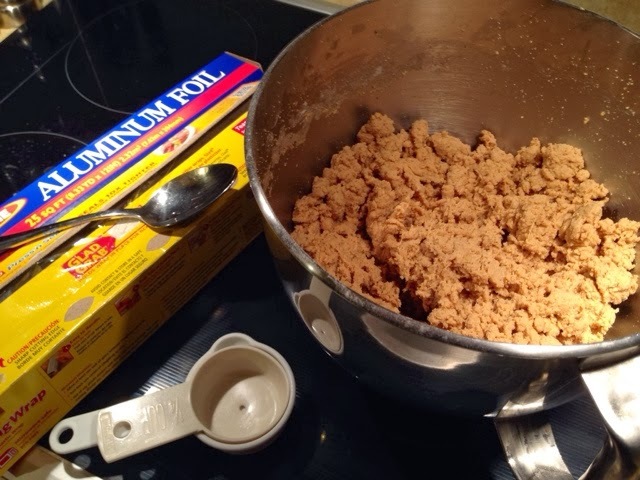 Spoon out seitan mixture into your measuring cup and portion a heaping 1/4 cup of seitan. By hand, roll lightly into a log (hog dog shape) and place on the plastic wrap. 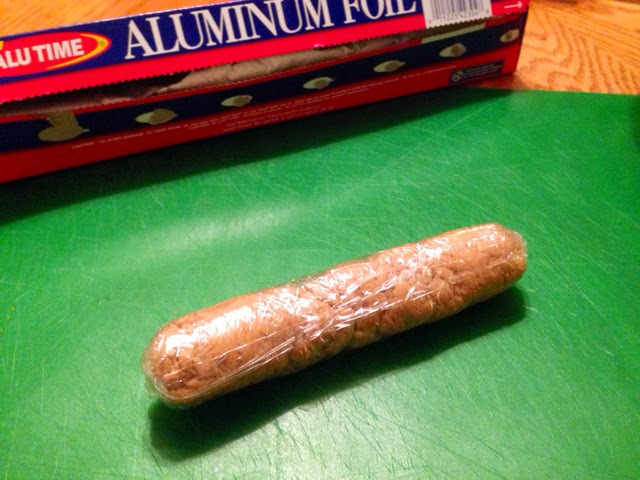 Cover the seitan with the short end of plastic wrap and lightly shape while rolling the plastic wrap around the seitan (evening). 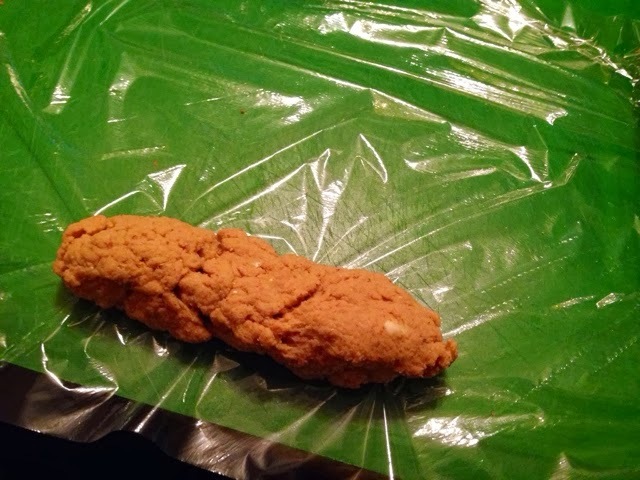 You will end up with a hot dog shaped little package, twist the ends and fold under the log to seal it in tightly. 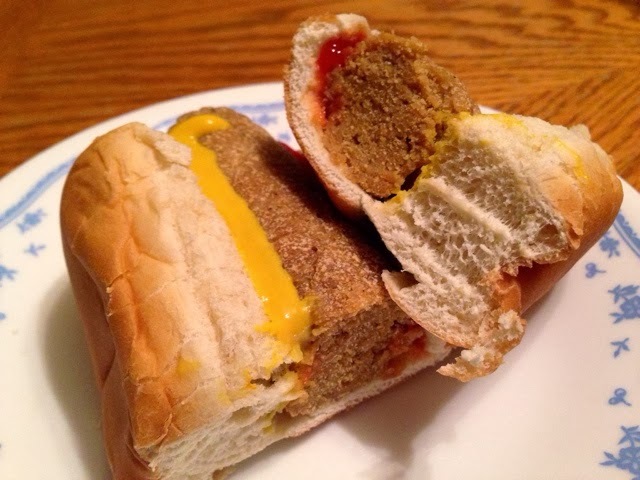 Continue rolling each hot dog until you run out of seitan. The next step is rolling each plastic covered dogs until tin foil. 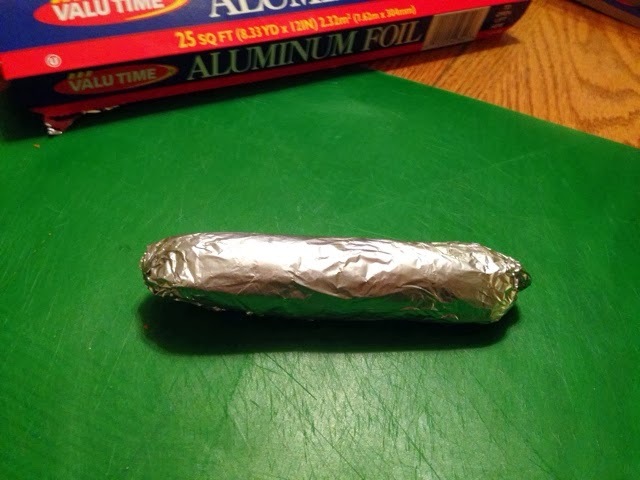 Portion out tin foil and tightly roll each until none remain. In a large pot with a strained basket attachment, fill it with enough water to create a steamer. You don't want any of the water to touch hot dogs, but you want enough water in there to last. 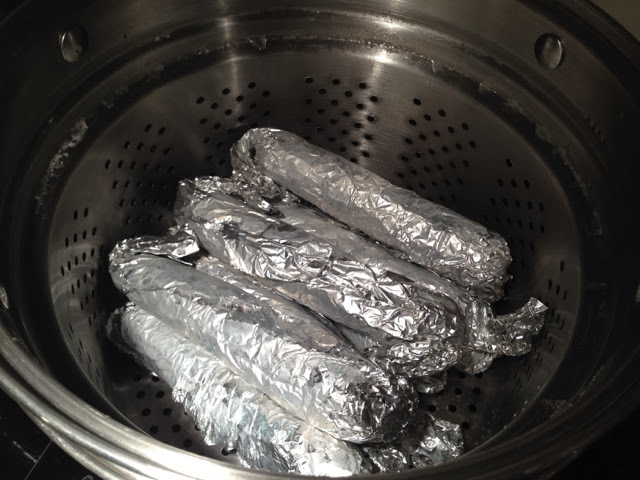 Completely cover the wrapped hot dogs with a lid and allow the water to boil and cook for 30-40 minutes. When the hot dogs are completely done they will be dense but have a slight spring back when pressed or squeezed. Once cooked to this texture, remove from the heat and allow to cool completely. To serve, remove the foil and plastic wrap and either eat as is or pan fry/grill for golden brown appearance. 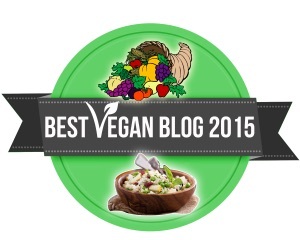 Pair the vegan hot dogs along with your favorite toppings and other Super Bowl foods. Make and store ahead of time in a freezer safe bag and serve as desired. You are sure to never buy those store brands ever again, Enjoy!